I recently ordered a bunch of 30 mm high trees from a Chinese seller on eBay. 100 trees for 8 quid, delivered post-free in a week and a half. I have to say I am pleased with the product, the price-quality ratio can not be beaten easily (although I am a bit worried about the kind of work-life balance the people who make this product have). The trees are twisted and painted wire, with flock-clumps to represent the foliage. Not the sturdiest construction I’ve seen, but they seem to be good enough to sustain the rigours of gaming. Everestmodel is the seller, and here is a link to the trees on eBay. 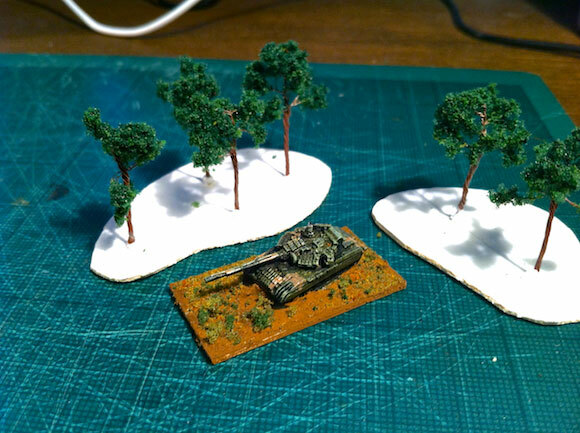 Anyway, the picture shows a quick test how these trees work with 1/300 scale figures, in this case a Cold War Commander tank. Seems just perfect to me. I’ve been planning to base the trees 3-5 to a base, and multiple bases to cover a wooded area. I bought a bunch of the same trees some years back and have been happy with them. I hesitated buying on the same reasons as you did, but then reasoned that everything is made in chinese cheap labor sites these days anyway, now there’s just one fat white man less in the middle! My only gripe was that the light green ones are not very good looking. I bought a bunch of them and they’re almost neon yellow.